My life began in 1920 in a beautiful, cultured city in eastern Poland named L’vov. I was born into a highly successful business family as the youngest of three girls. My early years consisted of friends, good schools, beautiful clothes and a mother and older sister who adored me. My father, Wiktor Grutz, owned a soap factory; my mother, Rosa, worked in our soap and candle store. My dream was to immigrate to Palestine and study medicine. When the Nazis invaded Poland in 1939, my dream, my country, my family and my life were torn apart. L’vov was a war zone between the Russians and Germans. When the Russians were in control my father was taken to Siberia. Soon after, I told my mother, “Mama, the good years are gone.” I learned Russian and studied accounting to obtain an office job. In 1941, after the Germans pushed the Russians back, the true nightmare began. My mother was murdered, I lost my sisters and their families, and I was sent to the Janowska concentration camp. When the Germans liquidated the camp by shooting us in the forest I fainted and awoke among dead and dying bodies. I escaped through the forest and encountered a farmer willing to help and feed me. Afterwards, I began working for the Germans in a post office, but also assisted in the underground. I secretly, and with great risk, stamped travel papers for members of the resistance, allowing them to travel through German-occupied territories. Though I was risking my life, I was willing to do this, and I did it well. In 1944 I realized it was time for me to escape, and on New Year’s Eve I ran away. I went to Romania where I worked with a Russian medical unit near the Russian Front scrubbing floors, washing dishpans and taking care of wounded soldiers. It was during this time that I met my future husband, Josef Morecki, a Jewish soldier in the Russian army. After he was sent with his unit to Berlin, I moved with the medical until closer to L’vov and in 1945, I left the Russian medical unit and traveled home in a cattle train. Home was not what it used to be. All was gone. No one had survived, not my beautiful family, nor my beautiful city. I had traveled through Poland, Russia and Romania, finding what jobs I could, fighting constant hunger and fear, assuming false identities, taking risks and trying to stay alive, escaping when it became too dangerous to stay put, hoping to find others who had survived. But this was not to be. Then one night, unexpectedly, a knock came on my door and there stood Josef. We married in Katowice, Poland, and traveled to a Displaced Persons Camp in Austria, from where we were to travel, illegally, to Palestine. Unfortunately, I took ill with scarlet fever and meningitis, and once again, my dream of going to Palestine was not to be. Eventually, in 1947, we immigrated to New York, where Josef worked as a butcher and I in a candy store. With time, Josef, a superb businessman, opened a hosiery business and things became a bit easier. We had two daughters, and eventually moved to California and remained together for 42 years until he died in 1988. We made good lives for ourselves and our children. The scars of the war were eased but never erased. Today my goal is to “never forget” the tragedy that my people and I suffered, and to speak about this to young people to fight bigotry, hatred and prejudice, and create life with respect and love. Our dear Mother, Grandmother, and friend, Nina Morecki, passed away on Saturday, April 7th at 9:30pm. Nina was born in Lvov, Poland. 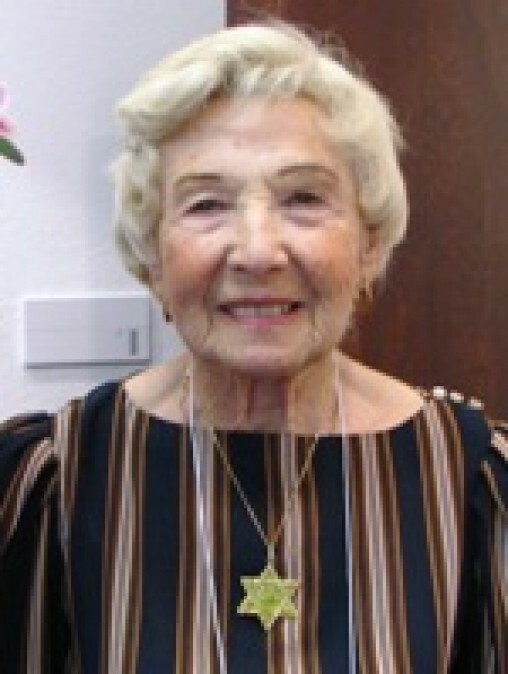 After surviving the horrendous atrocities of the Holocaust, Nina and her beloved Josef Morecki immigrated to the United States in 1947. Nina and Josef had two daughters, 3 grandchildren, and 2 great-grandchildren. Josef, also a Holocaust survivor, passed away in 1988. 2007: Through the Eyes of a Survivor is the story of Nina Morecki’s survival through the Holocaust, authored by Colette Waddell.